The crew from Summer Camp Island enjoying a night out. One of the less-than-enviable things about growing up in a major metropolitan area with slightly more protective than average parents is never having the chance to spend a few weeks during the summer in a magical world commonly known as sleepaway camp. 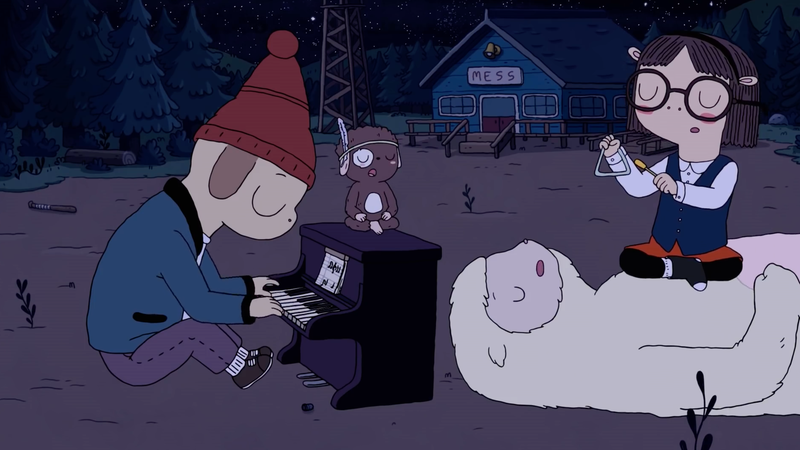 This cruel reality is one of the many things that makes Cartoon Network’s Summer Camp Island from creator Julia Pott feel like such a perfectly-wrapped gift—a quintessential piece of childhood that a lot of us only ever experienced second hand. Summer Camp Island is a charming series about Oscar and Hedgehog, two childhood best friends attending the titular summer camp which all manner of other anthropomorphic animal kids and magical creatures call home. The kids spend their days wandering through the island’s enchanted forest, their cabins, making friends with the moon, and trying to outwit the trio of teenage witches tasked with acting as their counselors. Each episode focuses on a different aspect of the day to day activities that make up the summer camp experience, but there’s a through line that emphasizes what really makes camp a transformative, important time: you guessed it, it’s the friendships made along the way. Even though I spent many a summer running around day camps as a kid and eventually ended up working as a camp counselor during college, neither of those are really quite the same as being shipped off during your adolescence to a place where you’re effectively given the chance to become a wholly new person in an unfamiliar setting. That’s always what summer camp meant to me when I’d hear friends’ stories about epic, hours-long games of capture the flag and care packages that were like buoys cast out at sea to remind them that there would always be a way back home. Summer Camp Island takes the whole of those experiences and transforms them into a fantastical narrative atmosphere that’s less concerned with the specifics of what camp is like in favor of telling stories with the dreamlike sheen that comes from fondly remembering something from your past. Here, a falling out between friends over the loss of a friendship bracelet isn’t just something that sours feelings, it’s the impetus for a devastating cataclysm that threatens the world’s bodies of water. Snooty older counselors don’t just seem to be evil, they’re literal witches with no qualms about using their powers to (lovingly) torment campers for a joke or two. The stakes are all too real for Oscar, Hedgehog, and their friends, but Summer Camp Island always comes back to a warm, fuzzy place reminding you that camp’s fundamentally meant to be a place for fun, exploration, and discovery. Nothing will ever fill the hole in my heart where memories of jumping into questionable lakes and guzzling even more questionable bug juice should be, but, in its way, Summer Camp Island is doing a damned good job of giving me a taste of what nostalgia for those things is like.